Creating an image backup of your SSD drive is the best way to prevent data from losing. AOMEI Backupper is a free SSD imaging software for Windows 10/8/7 which allows you to backup SSD regularly. What’s the SSD? SSD is short for Solid State Drives. The SSD disk has more advantages than the traditional Hard Disk Drive (short for HDD): faster speed of reading and writing, Shock resistance, lower power consumption and no noise. Because of these advantages, the SSD makes you feel so smoothly when the computer is running with it, some advanced users use the SSD disk to install system, some large games and applications usually. If you are a game enthusiast or need a fast Windows environment, maybe you can get one. Why Do You Need SSD Imaging Software? Although the SSD has so many advantages than original HDD, it can be damaged by improper operation, or cause system crashes because of software issue at any time just like the HDD. Thus, you need SSD image software to prevent from losing data, which allows you to backup and restore data from an image file between SSD and HDD. Maybe your disk had been damaged by unknown problems once, the important data you have stored before get lost. You must be very upset that why not use the imaging software for SSD earlier. With the help of SSD imaging software, you can get your important data back by restoring operation. AOMEI Backupper Standard is the best free disk imaging software for Windows 7/8/10, and realizes these operations fast and easily. How to Use the Free SSD Imaging Software - AOMEI Backupper? The SSD imaging freeware - AOMEI Backupper can image data to prevent your important data from loss. You can restore your important data with the image file created by AOMEI Backupper. 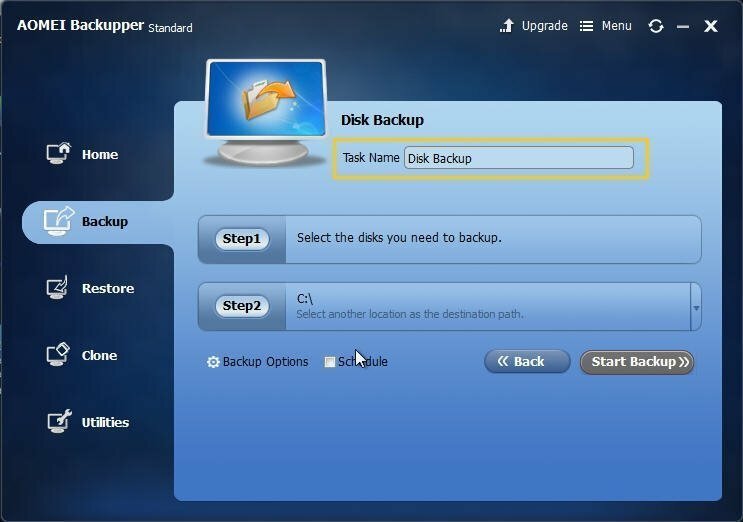 The following steps are how to backup data from SSD drive to another location with AOMEI Backupper. 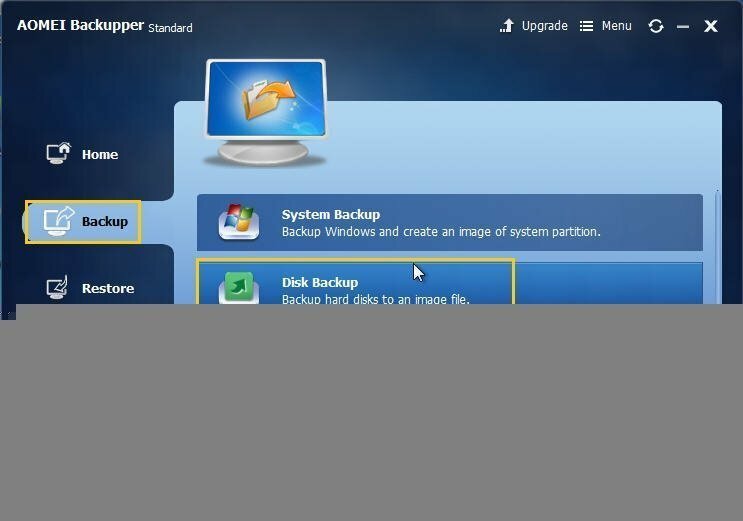 1.Download and launch the AOMEI Backupper, select "Backup" -> "Disk backup". 2.Specify a name in the "Task Name" box to distinguish the disk backup from others (here is Disk Backup). Click the button in "Step1" to select source disk. 3.Choose the SSD drive as source disk (here is Disk0), and then click "Add" to continue. 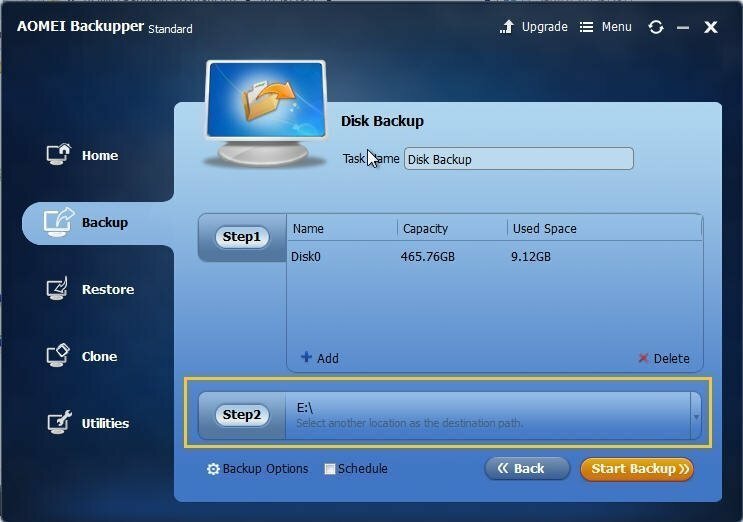 4.Select a destination (here is E partition) to save the SSD backup image file in the "Step2". You can also choose an external hard drive, USB flash drive, NAS device, or network share as destination. Tips: You also can click “Backup Options” to configure the SSD image and click "Schedule" to image SSD automatically via daily, weekly or monthly. 5.Press "Start Backup" button to start imaging SSD. 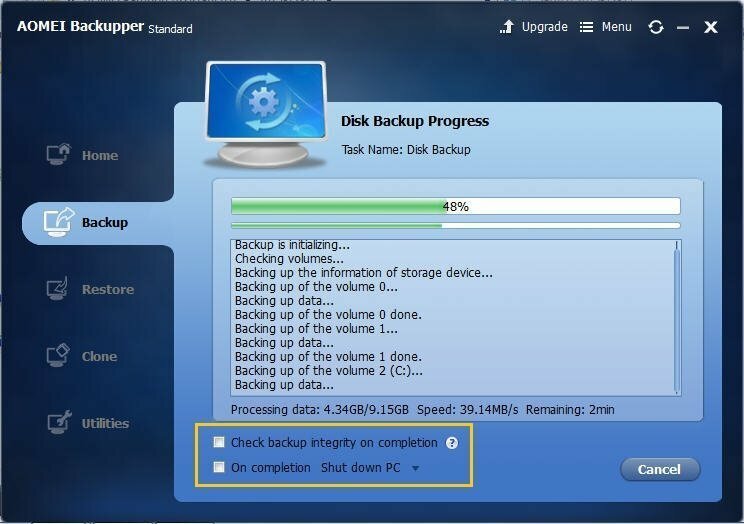 When the backup is processing, you can tick "Check backup integrity on completion" to ensure your SSD backup image could be restored successfully. If necessary, tick "On completion Shut down PC/Restart PC/Hibernate/Sleep". The backup will be completed in 10-20 minutes; it depends on the size of data on the SSD disk. Then press "Finish" button. With the help of free SSD imaging tool, you can make sure the data on your ssd is safe. If you want to restore your disk with the image file, you can go how to do disk restore. AOMEI Backupper has more features, including backup to NAS, file sync, incremental and differential backup, partition backup, system backup, make bootable media etc. In addition, AOMEI Backupper as thebest cloning software for ssd allows you clone SSD to larger or smaller SSD easily, migrate OS from HDD to SSD, and more.